"God has always been in my heart and a part of my life and my family's lives. It is through Him that we draw our strength." "I avoid using the term 'religion', because many people say 'my religion' this and 'my religion' that. Why should it be 'my' religion? I just believe what’s in the Bible with regard to which religion is involved. I simply believe.... I believe in it and I get down on my knees every night and thank God and ask Him to lead the way." "Michael’s family was famously religious - they were Jehovah’s Witnesses and Michael occasionally disguised himself to join his fellow believers as they went from house to house, inviting people to think about God. As a grown man, he has moved beyond denominations of faith - his concern is not with religion but with spirituality. This gives him strength, but I think it is the joy he takes in life which keeps renewing his vitality - that, and a second factor which I shall describe in a moment." "My mother knew her polio was not a curse but a test that God gave her to triumph over, and she instilled in me a love of Him that I will always have. She taught me that my talent for singing and dancing was as much God's work as a beautiful sunset or a storm that left snow for children to play in. Despite all the time we spent rehearsing and travelling, Mom would find time to take me to the Kingdom Hall of the Jehovah's Witnesses, usually with Rebbie and LaToya." "Each day I take time out to study the Bible, no matter where I am. The teachings of the Bible have added a new dimension to my life. It, somehow, makes me whole." "To say God is not everywhere is like a fish saying water is not around him." Rabbi S chmuley Boteach: Do you think a hatred of pride is still a relic of your religious upbringing? RSB: How did it hurt you? 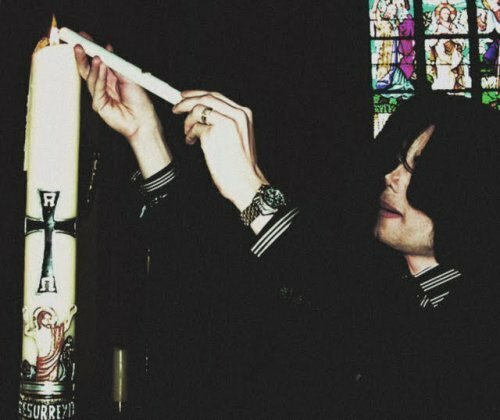 MJ:r... (long silence) When I did certain things in the past that I didn´t realized were against the religion and I was deprimanded for it, it almost destroyed me. Certain things that I did as an artist in my music I didn´t realized I was crossing a line with them and when they chastised me, it really hurt me. It almost destroyed me. My mother saw it. RSB: Their disapproval, their rejection? MJ: When I did the Moonwalk for the first time, Motown 25, they told me that I doing burlesque dancing and it was dirty and I went for months and they said, "You can never dance like that again." I said 90,9 percent of dancing is moving the waist. They said, "We don´t want you to do it." So I went around trying to dance for a long time without moving this part of my body. Then when I made Thriller with all the ghouls an ghosts, they said that it was demonic and part of the occult and that Brother Jackson can´t do it. I called my lawyer and was crying and I said: "Destroy the video, have it destroyed." And because he went against my wishes, people have "Thriller" today. They made me feel so bad about it that I ordered people to destroy it. RSB: So you have seen two sides of religion, the loving side that teaches you not to like pride and humility, but you have also seen what you would described as mean-spiritedness and judgmentalism. „From the beginning it was always a quandary for me, Michael’s birthday. From the first day we met, unfamiliar to me, I was faced with his chosen religion, Jehovah’s Witness.When Michael arrived for his photo shoot for THRILLER, two men accompanied him impeccably dressed in suits, who sat over to the side on some cushy couches and watched his every move. Since this was the first time I worked with him, it didn’t feel appropriate for me to ask who they could possibly be. I thought if he wanted us to know, he would have told us. I just felt their presence throughout the entire day. They left with him as mysteriously as they had entered with him. At the time I really did not give it another thought, because I had no idea of the adventure that was ahead of me. The next shoot, there again…a mysterious gentleman, sitting in the background. As our working relationship and friendship began to grow, I asked. He explained to me he was a Jehovah’s Witness. He was very active with the church, and these gentlemen were monitors. They watched over him. He also explained he went to bible study, and spent time going door-to-door teaching the word each week. I had to take pause for a minute and think about that one…. He gave me one of his hi pitched belly laughs…and said, “yeah”. He further explained that he does it in disguise. “Wow, I wish I could be a fly on the wall and watch that. I still can’t believe you do that.” I said. “Isn’t that difficult, when the world around you is decorating and singing carols?”. I could genuinely see the sadness in his eyes and the sense his feeling of loss, not celebrating Christmas with the other kids…so I changed the subject. One August 29th, we ended up working. Everyone was wishing him Happy Birthday and giving him little presents. He smiled and graciously accepted them. Once we were in the privacy of the trailer, he put the gifts down on the seat, and looked down at them. I was torn. I once again saw how sad and conflicted he was on the inside about this, but he remained loyal to hi s beliefs. It was so difficult for me too. I wanted to give him a present and a big birthday hug every time August 29th rolled around, and join in with the others who were celebrating his birthday around him. I also wanted to comply with his request not to even SAY happy birthday. We were shooting SMOOTH CRIMINAL. I was accustomed to the monitors by now. The filming was going on longer than planned, as usual. We were preparing for a very big scene. Michael was surrounded by the alien battalion in a gully, built on stage 14. The special weapons and ammunition team had briefed Michael on how to hold the machine gun and fire it. It was the last scene of the evening. Michael was having fun with it, like a little boy playing army. He took a strong stance, and fired as the cameras rolled. That was a wrap for that evening, and we were given our call time for the next morning. Michael was a little late arriving the next day. I was waiting in his trailer. He walked in so distraught. I didn’t understand, we were having so much fun the night before. He was silent as he sat in the makeup chair. I had to ask him please tell me. Please tell me what is wrong. His eyes welled up with tears. “Mother called last night. The church called her, and told her that I held and fired a gun yesterday. They ordered that I have to make decision. I must leave the church, or leave the entertainment industry.” He was weeping as he uttered those words. “I see, you are here today”. “Mother is supporting my choice”. It took a while for Michael to adjust to his choice. He continued to feel uncomfortable with his birthday, but attended fan events in his honor, and truly enjoyed them. When I was around him during Christmas, he would hide in his own closet to secretly wrap presents. He still held a tinge of guilt. I knew it was difficult for him, but I know he loved all the decorations that NEVER came down. He could freely give his children the birthdays that he never had. I knew deep down inside the Jehovah Witness teachings continued to hold a sacred place inside of him. That is why I was forever torn by not saying “Happy Birthday”. He never released me from my promise to not say it to him. "It's strange that God doesn't mind expressing Himself/Herself in all the religions of the world, while people still cling to the notion that their way is the only right way. Whatever you try to say about God, someone will take offense, even if you say everyone's love of God is right for them. For me the form God takes is not the most important thing. What's most important is the essence. My songs and dances are outlines for Him to come in and fill. I hold out the form. She puts in the sweetness. I've looked up at the night sky and beheld the stars so intimately close, it was as if my grandmother had made them for me. "How rich, how sumptuous," I thought. In that moment I saw God in His creation. I could as easily have seen Her in the beauty of a rainbow, the grace of a deer bounding through a meadow, the truth of a father's kiss. But for me the sweetest contact with God has no form. I close my eyes, look within, and enter a deep soft silence. The infinity of God's creation embraces me. We are one."" "Michael is a very special man. He would come in for his lesson and sit down and we would have a prayer and then read the Bible and then have another prayer and start to work. That's the way he liked to begin his day. Can you imagine a performer as big as Michael Jackson turning around in a lesson and discussing how wonderful God has been to him and how much he loves God?" "You know, there was one moment. I was playing a piano, and he was standing next to me. All of a sudden, he stretched his hands, looking upwards. It seemed to me that it was very important to him. That’s why I left the room and switched the light off. After half an hour I came back to the room. He was whispering: “Thank you for my talent. Thank you for everything I’ve got. Thank you for all the people who love me. Tell me what I should do, and I’ll do it.” It seemed to me that it was the moment of his communication with God." "I thank God every day, I really do. Because he didn't have to pick me. He is the reason for everything." "Consciousness expresses itself through creation. This world we live in is the dance of the creator. Dancers come and go in the twinkling of an eye but the dance lives on. On many an occasion when I am dancing, I have felt touched by something sacred.In those moments, I felt my spirit soar and become one with everything that exists. "I admired Michael Jackson’s ability to be totally “in the moment” whether he was with his fans signing autographs or dancing. It was one of the first things I noticed about him...his focus on “now”." "There’s a reason God made the sunset red or purple or green. It’s beautiful to look at, it’s a minute of joy...Like when I’m 40,000 feet in the air in a Jumbo Jet at night and it’s dawn. Everybody on the plane is asleep, and here I am in the cockpit with the pilots...it’s just incredible seeing a sunrise and being up there with it. Pilots tell me, “I wish there was no such thing as having to go down and re-load with fuel. I wish I could stay up here forever"...And I totally understand what they mean..."
"Sundays were sacred for two other reasons as I was growing up. They were both the day that I attended church and the day that I spent rehearsing my hardest. This may seem against the idea of ‘rest on the Sabbath’, but it was the most sacred way I could spend my time: developing the talents that God gave me. The best way I can imagine to show my thanks is to make the very most of the gift that God gave me. Church was a treat in its own right. It was again a chance for me to be ‘normal’. The church elders treated me the same as they treated everyone else. And they never became annoyed on the days that the back of the church filled with reporters who had discovered my whereabouts. They tried to welcome them in. After all, even reporters are the children of God. When I was young, my whole family attended church together in Indiana. As we grew older, this became difficult, and my remarkable and truly saintly mother would sometimes end up there on her own. When circumstances made it increasingly complex for me to attend, I was comforted by the belief that God exists in my heart, and in music and in beauty, not only in a building. But I still miss the sense of community that I felt there — I miss the friends and the people who treated me like I was simply one of them. Simply human. Sharing a day with God. There have been times in my life when I, like everyone, has had to wonder about God’s existence. When Prince smiles, when Paris giggles, I have no doubts. Children are God’s gift to us. No — they are more than that — they are the very form of God’s energy and creativity and love. He is to be found in their innocence, experienced in their playfulness. My most precious days as a child were those Sundays when I was able to be free. That is what the Sabbath has always been for me. A day of freedom. Now I find this freedom and magic every day in my role as a father. The amazing thing is, we all have the ability to make every day the precious day that is the Sabbath. And we do this by rededicating ourselves to the wonders of childhood. We do this by giving over our entire heart and mind to the little people we call son and daughter. The time we spend with them is the Sabbath. The place we spend it is called Paradise." "During the meals I've had with him, he did pray silently. When he prayed out loud, it was always to God, but that doesn't mean he didn't use any other names. We would talk about god and grace and humility a lot. One day MJ and I were working on some new music, and during a break we started talking about the name Michael. He said "Hey, Bearden! Do you know what our name means?" I didn't know. He said it means "most like God." And then he said to me, "We can't be big-headed about it. We have to be humble or God could take our gifts away. Promise me you'll be humble!" "Michael maintained his integrity, a Christian-like attitude, a sense of humbleness and kindness, even when he was being torn apart by the wolves. That says something. I believe that came from his faith and from the love of God that filled his heart." "God was his guide. He was a Christian and believed in Christ. His life went through so much that his faith was what restored him and kept him. Michael was very spiritual and had enormous faith. He studied all religions and was open to a lot of different practices, however, ultimately, he was a Christian and believed in Christ fully." "On my second trip to Neverland, Michael Jackson hosted a private lunch. He asked us all to connect by holding hands and saying praise. He said a prayer, the peeping sun rays shot through the house setting in his honour, his energy was spiritually magnetic, encapsulating each of us with his engimatic aura leaving all of us in tears. He was an incredible light. ´THIS WAS WRITTEN FOR ME IN THE BOOKS. I HAVE PROVEN MY PART. NOW GOD WILL BE THEIR JUDGE´ Michael Jackson said on the evil do-ers who lied, cheated and betrayed him. I BELIEVE GOD WAS HIS GUIDE, THAT IS HOW HE LIVED AND COPED IN THIS CRUEL WORLD." While acting his part, in Eternity he stayed. "In my opinion, he has to have been the best Christian of this century, or at least one of them. Whether or not Jesus was real, MJ came as close (to him) as any human possibly could, imo." "I’ve just left a Chinese Michael Jackson forum, where some members are expressing interest in knowing Jesus because they want to see Michael Jackson again in afterlife. There are people who want to buy the Bible and who go to church for the first time because of Michael Jackson. Most Chinese forums I’ve been to are somewhat hostile towards Christians and Christianity. But now I see all over the MJ forum people are talking about God and Heaven. If you are familiar with Chinese culture you will know that ‘God’ (shang di) and ‘Heaven’ (tian tang) is not a common vocabulary among Chinese people. But it is all over the place now."